They were partying at Stephen's on State in Media. Although parties in Media are common, this one was different. It was 15 years in the making. 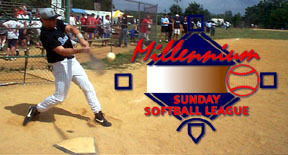 Bobby Jones collected six hits, including a pair of doubles, and five RBIs as Stephen's topped Printz Beverage, 8-7 and 20-15, to win the Millennium Sunday Softball League A Division championship. It was the first title in 15 years for the team that has been sponsored, at one time or another, by the Springfield GOP (even though most were Democrats), Sligo Irish Pub and Double Edge Sports Grille. Jones and Mark Nevins had three hits and two RBIs apiece, and J.J. Jordan plated three runs in the opener. Jones added three hits three RBIs in the clincher. Anthony SanFilippo Jr. beat out a pinch hit, infield single with two outs in the bottom of the fifth inning to plate the winning run. That was part of an eight-run rally. Tim Coulter chipped in with three hits and four RBIs. Marty Magee's Weekend Warriors 4-6-4, Ram's Head Tavern 9-5-2 >> The Warriors used a walk-off hit in Game 2 and great defense in Game 3 to take the C Division title. A hit by Jerry Bass in the seventh inning of Game 2 drove in Terrance Boswell with the run that forced the rubber match. Boswell was 2-for-3 in that game. Steve LeViere picked up his second win in Game 3 thanks to some solid defense. Premier Orthopedics 14-6-6, Casey's Ridley Park 4-7-5 >> Greg Watson drove in the tying run in the fifth inning and the winning run in the seventh to give Premier its first championship in six years. John Adams pitched all three games for Premier and held Casey's to 16 runs over 21 innings.